In Rhapsody, you take the role of Cornet Espoir, a rambunctious girl who dreams of being swept off her feet by a prince someday. Namely, Prince Ferdinand, a handsome ruler in a nearby kingdom. Not only a hopeless romantic, Cornet can also talk to dolls and puppets. To mak e things weirder, she can use the power of her trumpet to bring them to life. This proves useful, as once the prince is accidentally turned to stone by Marjoly, a lascivious witch clad in what might be classified as colored dental floss, Cornet must use her power to try to save Ferdinand from Marjoly and her cronies. 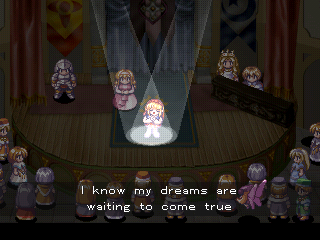 With the help of her faithful puppet, Kururu, and various other strange inhabitants of the lands, Cornet makes her way to save her prince and win his heart. The game plays out like a lot of other role-playing games. You travel place to place by choosing the location on a map, then travel more in depth once you choose that place. Once you enter a random encounter, however, you’re treated to a small grid on which Cornet and up to three of her puppet pals can move about and attack the enemy. Rather than the turn-based battles you would expect, the game’s battles play out strategically, like Final Fantasy Tactics or Advance Wars. 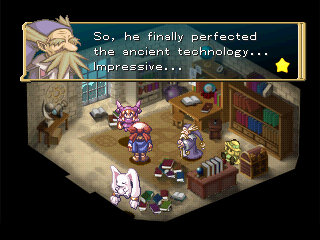 This is an interesting touch that, like most elements in the game, sets Rhapsody apart from many other RPGs. The allies are also interesting. First, you have to find the puppets, and sometimes they have tasks for you. Once they join, certain puppets will work a bit more effectively if they’re in a party with certain other puppets (The Egg Brothers and the Angel Sisters come to mind). On top of that, if you play with those certain puppets in your party up to a certain level, you’ll free their souls, which gives you a bit more insight to the ‘characters’ and seems to make them a little stronger. Some puppets are tough to find in long interweaving dungeons, and some just arrive in your mailbox. It’s up to you to find them. You can also recruit monsters every so often after battles. Your party options end up pretty large by the end of the game. So what’s Cornet’s role in combat? Well, she can attack, which is fine and good, but she can also use her horn to power up her puppets- not the monsters- to make them stronger. As she powers them up, she can perform super attacks. Almost all of them are desert related (Pancake was a particular favorite), but they all provide some very helpful assistance in battle, either creaming the enemy with pastries (get the pun there?) or healing everyone on the board. Cornet’s definitely not a wilting flower in terms of combat assistance. So far as the game goes in terms of ‘pros’, it’s a solid game. The music is fun, the characters are interesting for what little development most of them get, and the interface is relatively easy to get through. Personally, I didn’t find myself riveted by the plot or the depth of play, but by the sheer fun I had playing the game. The collector in me harkened back to Suikoden and Pokemon where I felt like I needed to recruit every puppet and enemy I could get my greasy little hands on, and there’s not one particular character that didn’t meet the standards of the rest of the party once they reached the same level, making it easy to interchange characters. This is something I find as an issue more often than not, leaving certain characters by the wayside while others are constants in the party. The idea of mixing the typical exploration maps of others RPG’s of the time with strategy and grid-based combat occurring during fights caught me off guard, at first. It became very engaging, though, and I liked the touch. It just managed to make the game feel less like a clone of other games being put out at the time. While, from what I know, this was erased from the DS version of the game, I feel like this is another bit of charm that the game puts forth. Definitely a noteworthy effort. Apparently, however, that wasn’t the only thing that was erased from the DS remake. As a brief disclaimer, in case anyone decides that they like this game’s idea and they want to experience it, I’ve heard that the DS version lacks quite a bit of the charm from the original. A lot of promised ‘extra’ content was left off, and the songs are also absent- which defeats the purpose of it being a musical. This is a brief blurb, as I haven’t played that version, but I’ve heard that if you’re a purist, the original is t he only way to go. As for downsides to the original Playstation game, they are all basic and preferential. You can breeze through the game pretty quickly- I think I racked in at about twenty to twenty-five hours- and there really isn’t much challenge to speak of. I don’t remember seeing the ‘Game Over’ screen once throughout the game. Much like Final Fantasy: Mystic Quest, this almost feels like an introduction to RPGs. I’m not likening the game wholly to FF:MQ, as this doesn’t feel dumbed down so much as simple. Instead of a slap in the face, it feels like a pat on the bottom through the gate of role-playing. As would be expected from any musical production, the game’s strength lies in its front end. The music is fun and well executed. The musical numbers are a little forced, but that’s the musical theater actor in me talking so it’s subjective. People in the room were definitely shushed when I was playing this game and a musical number came up, though I think my favorite was the song that the Frogs sing when you reach their village. This sounds a little strange, but you’ll get it once you play. You also have to appreciate that everyone- good and bad- gets their chance to shine in a musical number. The backgrounds and other scenery pieces are very nice with lush green forests, deep russet dungeons, and shimmering blue oceans through each locale. The one thing I disliked, and again, this is personal preference and I can’t stress that enough, was that the character portraits weren’t just anime. They were incredibly warped anime. The character sprites are amazing, and being able to see a bunch of the production art throughout the game shows just how good the artist was, but the faces that appear with all of the text almost seemed to be squashed into the space of the text box rather than resized. This wouldn’t be a con usually, but whenever someone talks, the faces appear and it is something you’re constantly reminded of. It’s a nitpick rather than a full-on criticism. While the game is brimming with charm and entertainment, the game itself does not hold up to the test of time very well. What it does do is serve as a happy reminder of RPGs back in their heyday, when no every main character had to be an anti-hero and not every plot had to end with the party fighting thirteen incarnations of the main boss followed by the actual ‘main boss’. It’s a diversion and a jovial one at that, never taking itself too seriously and showing that you don’t have to be the deepest or most advanced game to show a player a good time. You won’t walk away from this game with your life changed, but you’ll sit back with a smile on your face and a good mood while the credits roll- if you’re into that sort of thing.